Last Friday, the Anti-Corruption Court Chief Magistrate Irene Akankwasa found the Soroti member of parliament Captain Mike Mukula guilty of embezzling Shs210m Global Alliance for Vaccines and Immunization (GAVI) funds meant for the HIV/AIDS victims. He was sentenced to 4 years at Luzira Maximum prison. 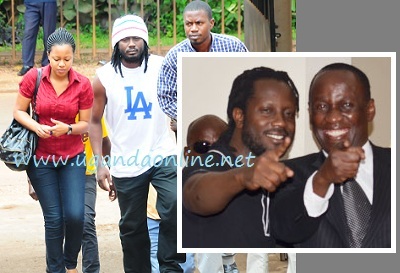 Bebe Cool was among those who attended the last court session that saw the Soroti MP sentenced. Before the court session could commence, Bebe Cool was at the Anti-Corruption Court early enough. Bebe hugged Captain Mike Mukula as a sign of rallying behind him. On passing the verdict, Mike Mukula was found guilty something that led to the collapse of his wife Gladys Mukula at the court premises. Bebe Cool and other sympathizers were touched prompting these words from the 'Kamwako' singer. "Am so sad coz ma close friend Mike Mukula has been sentenced to four years in Luzira among all the big guyz responsible for that money, only him taken in yet he even refunded the money. I know it's time for Ugandans to fight corruption but am also now joining the cause coz If Mike Mukula can be taken, then ever politician who has embezzled shud be taken to court and charged." He signed off by letting Allah be with him as he serves the sentence but also smuggled in this one "I hope murders are also charged." It's been a rare week in history that saw city tycoon Hassan Basajjabalaba arrested as he tried to live the country, spent two nights in Luzira before being released on a cash bail of Shs60m, Desh Kananura was equally arrested over the death of his employee who was found with Shs10,000/- and now the sending of Mike Mukula to Luzira. The Soroti MP had hopes of standing in the 2016 presidential elections but this now seems unlikely as he will be done with his sentence in 2017.